The tragic true story of news reporter Christine Chubbock. I first became familiar with the story of Florida news reporter Christine Chubbock when as a rather morbid teen I read David Slater and David Kerekes' 1994 tome Killing for Culture, and I was instantly baffled as to how Chubbock and her dramatic action wasn't more well known. She's most often cited as the primary influence on Sidney Lumet's Network, though its screenwriter Paddy Chayefsky always denied this was the case. Aside from that, her tragic tale has lain dormant until 2016, when both this and a meta-documentary, Kate Plays Christine, debuted at the Sundance Film Festival. If you weren't a teenage gorehound in the '90s there's a strong chance you're unaware of Chubbock, so I'll refrain from mentioning the exact reason behind her infamy for fear of being accused of 'spoiling' the movie, however I highly recommend you familiarise yourself with her story before viewing, as Antonio Campos' film will have far greater resonance if you're aware of its outcome. As told by Campos and screenwriter Craig Shilowich, Christine picks up several weeks before the incident that would shock America. It's 1974, and Chubbock (Rebecca Hall) is employed as a reporter at a small Sarasota, Florida TV channel. Like Jane Fonda in The China Syndrome and Steve Coogan in 24 Hour Party People, she specialises in fluff pieces, but is determined to move up to reporting hard news, and has her eye on a co-anchor role. When the station owner arrives in town with a plan to poach a couple of staff members for a more high profile Baltimore channel, Chubbock focusses on getting his attention, but her novel ideas are ignored by her boss (Tracy Letts, who at this point may be a better actor than writer), who like Rene Russo in Nightcrawler, has bought into the "If it bleeds, it leads" mentality. The specific reason for Chubbock's ultimate action is unknown, so Campos and Shilowich explore several possible motivations. Chubbock had suffered from depression, referenced here by her mother Peg (J. Smith-Cameron, wife of Kenneth Lonergan, fact fans) as an incident that occurred in Boston. She also experiences harsh stomach pains, ignoring them to the point where she no longer can, when she receives news no woman wants to. Despite having plenty of would-be friends, most of whom she barely acknowledges, Chubbock feels alone in a crowd, and has her heart set on winning over news anchor George (Michael C. Hall), who views her as no more than a colleague. And then there's the very '70s sexist workplace she finds herself in, with the station owner openly admitting he hired a co-worker ahead of her because she was a "hot little blonde." Hall has never been better than she is as the ticking human timebomb that is Chubbock here, delivering a performance that's heart-breaking despite its coldness. The film's warmth comes from those around her, from her loving mother, whose line "She's my favourite person" absolutely destroyed me, to her camera operator and friend Jean (Maria Dizzia, a relative unknown who instantly feels like a performer you've known for decades), whose well-meaning if naive advice for Chubbock is to eat a lot of ice cream and listen to pop music when she feels down. In his previous films, Afterschool and Simon Killer, both of which similarly focussed on emotionally troubled protagonists, Campos employed experimental techniques to convey his character's psychological states. Here he directs in far more conventional fashion, allowing his inspired leading lady to do all the heavy lifting. It proves a wise choice, as Hall really is sublime here, her criminally overlooked performance yet another reason to dismiss the relevance of the Oscars. Equally impressive is the entire ensemble gathered by Campos, which gives the sense of a team working together in a highly believable rendition of a newsroom. It's the most depressing episode of The Mary Tyler Moore Show you'll ever see. 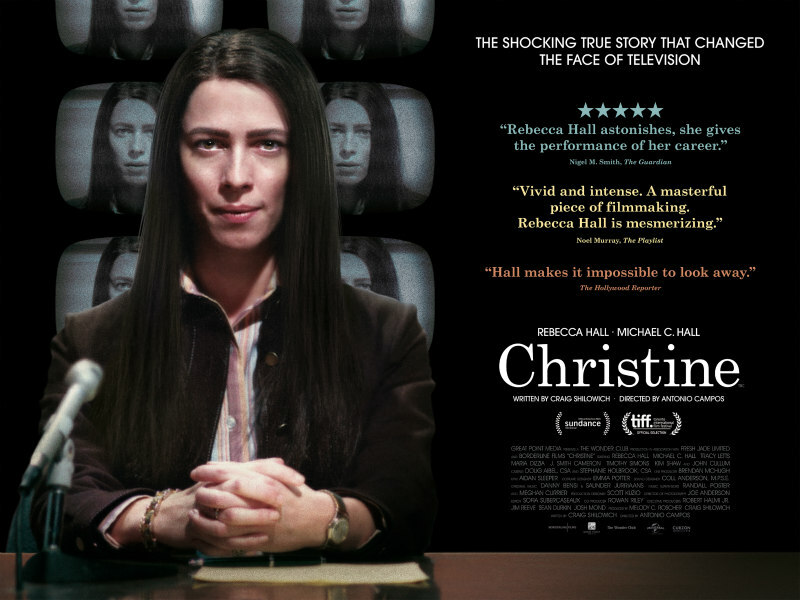 Christine is in UK/ROI cinemas now.